A skillful blend of uncompromising adherence to the core tradition of classical Carnatic music as well as a ceaseless quest for quality music in any form would best personify Bombay Jayashri. 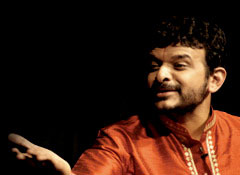 One of the leading figures in Carnatic music, he is a star performer, teacher, composer and researcher. Performing all over the world, he is representative of the classicists and his music reflects the core values of Carnatic music.